A number of newly built state-of-the art vessels came into service within the Seaway in 2012, boasting sharp increases in fuel efficiency and reductions in emission levels. “These new vessels, part of a billion dollar fleet renewal effort by domestic and ocean carriers, combined with our marketing efforts which have recorded 10.6 million tonnes in new business over the past five years, underscore the Seaway’s future potential”, added Terence Bowles, President and CEO of the St Lawrence Seaway Management Corporation (SLSMC). 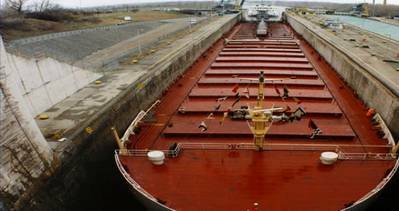 Tonnage increased by 4% to 38.9 million tonnes during the 2012 navigation season, exceeding the SLSMC’s original forecast by 300,000 tonnes thanks in part to a late season surge in grain movements. Strong performance within a number of core markets contributed to an overall gain of 1.4 million tonnes for the year, when compared to the Seaway’s 2011 result of 37.5 million tonnes. Demand for low sulphur coal in Europe led to a substantial increase in coal volumes, while busy Chinese steel mills triggered an upsurge in the demand for iron ore. The shipments of coal and iron ore were brought to the Great Lakes and loaded on domestic Laker vessels. The Lakers then proceeded from the Great Lakes to the lower St. Lawrence River, where the commodities were trans-shipped to larger ocean vessels, for export to overseas destinations. On the grain front, 2012 was a story of contrasts as strong Canadian grain movements offset a sharp drop in U.S. grain movements, due to the drought which impacted the majority of the U.S. grain belt.. Bowles emphasized the essential role that the Seaway plays within the North American transportation network. “The Seaway was instrumental in providing grain shippers with the means to rapidly respond and capitalize on market opportunities late in the season”, said Bowles.